Christmas Eve always reminds me of one very important moment in my life. As previously discussed, I have two memories from when I was two years old (the tiger and Super Mario Brothers). Matching this linear trend, I have one memory from when I was one year old. I’m genuinely hoping that doesn’t continue into my later years, since only recalling 27 things from this year would be rather awkward given how much has happened this year that my husband feels is very important for me to recall in vivid detail, but that foreboding future will be for New Years. So what was the one memory? My dear sister. Not the oldest one, but the middle one. The red head. When I was young, I was a nerdy, weird creature that confused those around me and sustained an early coffee addiction. When she was young, she was a hot-headed, active, problem-solving monster that baffled my mother at every turn. I used my powers of cute to play ALL the video games. She used her powers of pretty to aggravate ALL the boys. I used my powers of intellect to do all the homework. She used her powers of intellect to give me all her homework. It’s certainly a good thing my sister wasn’t evil, because with her influential powers, she could have likely brought great nations to their knees back in the day. Now, when I was one, my sister was more cute than pretty, and she also adored me. During Christmas Eve that year, my brain was hopped up on caffeine (thanks, Dad!). My speech was severely limited, my understanding of the world was severely limited, but I did know there were many bright and beautiful lights everywhere, I had enough energy to run a marathon, and these strange boxes with pretty paper were definitely meant for touching. ALL the touching. 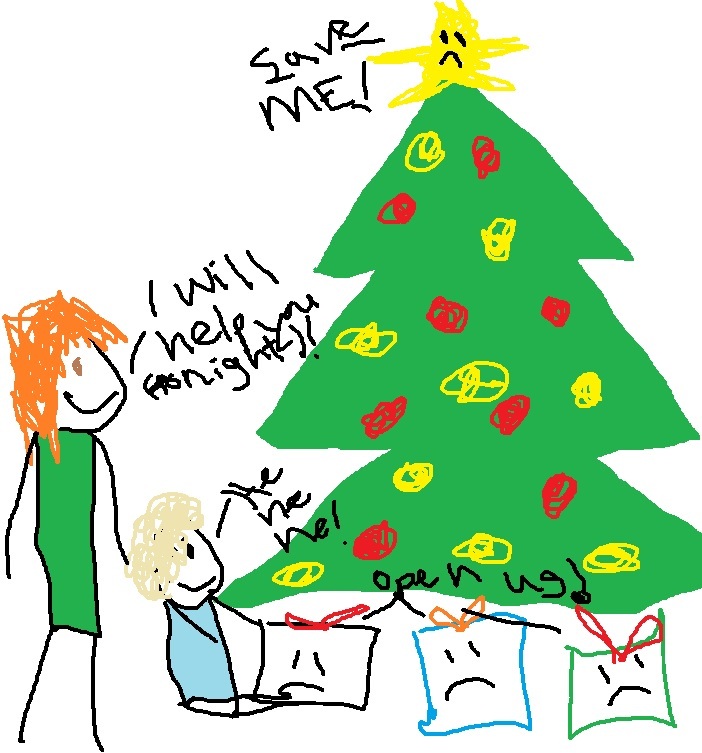 My sister was a very, very good big sister, and while she knew I wasn’t supposed to touch all the presents, she wanted to help out. After all, she had a full understanding of what was inside. Gifts, a concept that even after a birthday and this being my second Christmas was baffling, but my dear sister knew that I’d appreciate what I would eventually find inside. So, as a three year old, she decided to help me out. She waited until she was certain Santa had finished doing his duties upstairs (though he had a rather feminine sounding voice sometimes…perhaps Mrs. Clause had joined him hoping for more together time around the holidays?). Then she did what only a great big sister would do for her little baby sister. She opened ALL the presents. Then, wanting to be sure not to confuse her adorable little baby sister who had limited understanding of the world by giving her a pocket knife, she carefully sorted between presents intended for my mom, dad, my oldest sister, herself, and me. Quietly, she crept across the house with each floorboard creaking just a little bit more than the last to place down my oldest sister’s presents. Then, carefully, she made the journey to her room, plopping the pile down. Then very carefully, she went downstairs to drop off my parents presents with the door CREEEEEEEEEEKing ever so loudly. The gift bearer plopped down the gifts for my parents, knowing the jig would be up soon after that noisy display, and sprinted upstairs to grab my gifts. She knew she must be swift. Only one person left to go. The target. The most important recipient of Christmas gifts. Me. Seconds later, she slid into my room, panting. She flicked on the lights, quickly running to the crib, and climbed over the edge to get inside with me. She placed the gifts before me. I didn’t understand the things I was seeing or why they were there. Clothes, mostly, and a ball. One glorious ball. I stepped forward, wobbled, grabbed, and shoved the ball right in my mouth where I knew it belonged. I laughed happily as I drooled all over it. I had not slept thanks to my caffeine addled brain confused by all the crazy lights outside my window and the energy of those around me, but I knew what this was. It was ball. Within a minute it became clear my mom also knew what this was, calling to my dad to see what had happened. With tears in my eyes ball was taken from me as well as my sister. That was the first time I knew loss. Farewell, ball. My parents, to this day, are still perplexed how an illiterate three-year-old girl managed to figure out who had what present. I can’t speak on the matter too much myself, but I will say that ball and I reunited the next day. It was everything I had hoped it would be. I remember waking up when I was 3 in the middle of the night to see, much to my sleepy surprise, my then 27-year-old mother and 25-year-old father laughing manically while they played Super Mario Brothers 3. Why were they laughing? Turns out my mom enjoyed messing with my dad by jumping on a green shell and “accidentally” flinging it in his direction. My mom may be a troll. 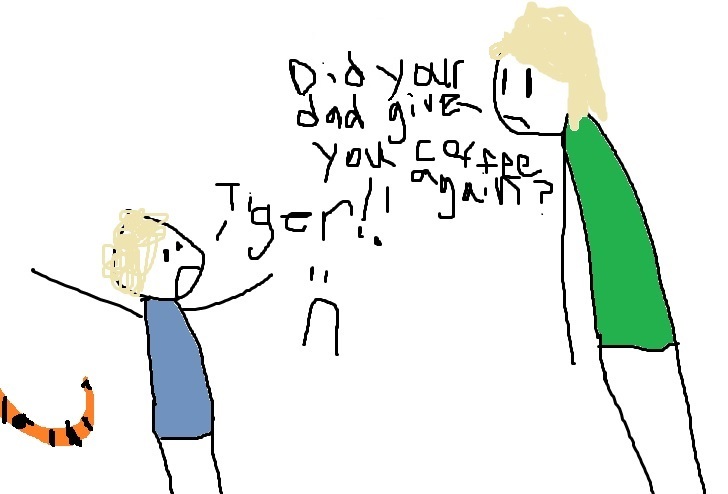 This, and being absolutely certain that a tiger entered my room in the middle of the night when I woke up and then went into my parents’ room where I was equally certain it was out for my dad’s blood are my only memories from that year of my life. Both memories had quite an impact. Given the nature of this blog, I’ll try to limit my details as far as the impact of the tiger incident, but suffice it to say my sister likes to occasionally joke that I married my very handsome Chinese American husband because he is a tiger. Rawr. My mother, as I’m sure you can sympathize, was not convinced. Right, Super Mario Brothers 3, laughter, parents. You’re probably curious why this had such an impact in my development, and honestly, even if you don’t care, I’m going to tell you anyway. My mom was always very nurturing and loving growing up, but she wasn’t really one to cut loose. So crazy laughter with a device I had thought was purchased to keep my older sisters and I out of their hair for an hour each day? Mind blown. Needless to say, I was hooked. Even more hooked than the first time my dad gave me coffee, but that’s another story. The next day, I spent hours playing with my middle sister trying to convince her that even my uncoordinated adorable self was a very good player 2, even if I unintentionally kept flinging green shells at her. Thank goodness for marriage in adulthood, because convincing people I was adorable enough to be a very good player 2 was significantly more challenging the older I got and the fact I’m an uncoordinated mess became far more pronounced. Video games is only a particularly important topic to me today because after I attempted to play more than 15 minutes (why that is a bad idea currently), I’m currently paying the consequences. My present consequences? Physical pain. The second worst kind of pain, second only to emotional pain inflicted by a loved one. Thank goodness my loved ones aren’t jerks. So! Back to coding with me. I’ll be starting on functions shortly, which should be fun. I think the largest struggle I’ve experienced with self-taught programming so far is that I feel like I want to learn everything all at once like some sort of mad sponge that absorbs information but very unlike actual sponges doesn’t release the excess liquid when I’ve been overzealous in my sponging. Much like an actual sponge, however, the result tends to be I leak information all over the counter and need to be left out to dry up overnight. Upon reflection, I’ve realized the title of my previous entry was severely misleading. I’ve been a technophile since the age of 3, and I doubt anything will ever change that. Except maybe constant EMP bursts across the world inhibiting technology from functioning sort of like how the elf-like race from Pandora’s Star blocked out technology on their planets. That’d be awful. With that awkward, foreboding ending, I bid you all a good night!